I bought one of these for running during the Winter months, when you inevitably find yourself having to make some runs in the dark or twilight. There are plenty of options out there - ranging from an offering at £5 from Tesco, right the way through to Hollis Canister diving head torches at £800. Obviously, there’s a trade off between getting what you pay for, choosing a light that’s suitable to your purpose, and not spending more than you need to. 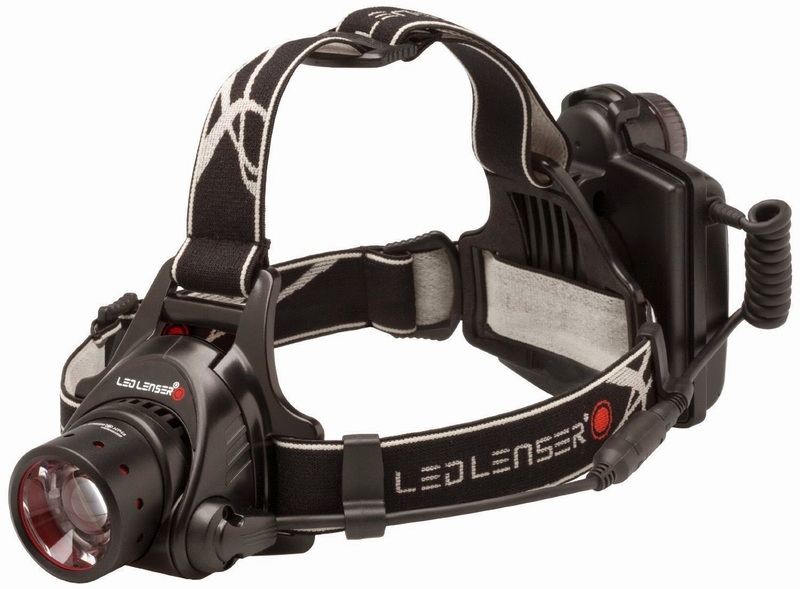 After checking out other reviews for several different options, I opted for the LED Lenser LED7299R H14R.2 Rechargeable Head Torch. You can spend anything from £90 to £130 depending on where and when you choose to buy this model. There’s also a similar-but-cheaper model in the same range that isn’t rechargeable. (No reason that you couldn’t buy separate rechargeable batteries of course.) However, I liked the convenience of having the recharging unit built in. It can alternatively take four conventional AA batteries, which you can use as a backup. For running, it was important that the torch had enough light output to be able to see in pitch darkness on unlit trails with occasional tree cover that blocks ambient light. It was also important that it was comfortable to run with. A lot of runners recommended the Petzl range of head torches. I can see why. They’re a lot lighter than the one I chose (whilst at the same time being a lot dimmer - typically about a third to a quarter of the light output.) My main criticism of the LED Lenser H14 R2 is that it can feel a bit hard and uncomfortable on your head, particularly the front torch holder. A softer, more padded material behind the lamp would have made it much more useable. As is, it’s more comfortable with a beanie hat underneath, but I wouldn’t fancy trying to run with it overnight in the Summer when a hat would make you overheat. In terms of light output, it was difficult to find reliable information. The minimum light output was fairly consistently reported by various sources to be 60 Lumens. The product box and the site where I bought it both say the maximum output is 850 Lumens. Other sources quoted as low as 260 to 350 Lumens.There appears therefore to be some confusion about what is meant by "maximum". Namely, the torch has a 'boost' setting that increases brightness for 10 seconds at a time. However, there is a second definition which is the maximum brightness that the torch is able to consistently maintain. I suspect this distinction accounts for many of the differences reported by different sources. 60 Lumens is about as good as the majority of the Petzl range. The brightest setting for the H14 R2, whatever the real value in Lumens, is a very bright light that is uncomfortable to look at directly at the highest setting. The very highest setting (known as the "boost" setting) only stays on for 10 seconds at a time. Most of the rest of the time, I used it at the highest 'stable' setting. On that highest constant-current setting, the light can be diffused over an area about 5m wide and 10m far directly in front of you. You can also elect to have a narrower but more intense beam. The specs say it will project light up to about 260m. I found that not to be the case, though I did stick to the “wide and bright” setting throughout my run. Perhaps the boost setting when combined with the narrowest beam would momentarily illuminate the farther "260m" distance quoted for 10 seconds at a time; I didn't test that, because such brief and narrow momentary brightness isn't relevant for my use case or many others I can imagine. I did test the range on the max consistent setting combined with a wide beam when I returned to my car. I found that whilst that setting is quite good enough for running/walking in the pitch dark by allowing you to see what's immediately in front of you, the light didn’t even make it across to the trees at the far end of the 100m or so car park I was in. I’ll try it again on the “narrow beam, temporary boost” setting during my next night run. However, whilst I suspect that the specs are technically correct and that objects will be able to be illuminated at that distance, albeit briefly, it is only with a beam that’s about 1m wide. It's for the reader to decide whether that performance meets their actual needs. I found the light was good enough for my use case. I ran during astronomical twilight (the third darkest phase of the night; pretty much pitch black for the purposes of this test.) Without the torch, I would just about have been able to see my hand in front of my face in open ground, but not the path I was running on. On stretches covered by trees, it'd have been completely dark. As it was, I missed a pothole in the same forested location (once on the way out, and once on the way back.) I couldn’t see how I’d done this at the time, as I felt I’d been seeing the path well enough to run at a normal pace. I stumbled at the exact same spot again, however the very next day during daylight. So, it just appeared to be a particularly well-camouflaged pothole, rather than a failing of the torch. The final lighting feature of note in this torch is the rear red light that you can turn on to allow traffic and cyclists to see you more easily. I thought that was a nice little safety feature. Although, there's no real way to tell if it's on or off once you have the torch on, and the button is very sensitive. Other non-lighting features include a battery-power indicator (the rear LED glows red, amber or green for five seconds when you switch it on, to let you know how charged up the battery is.) I've used mine for less than an hour so far, and it's still in the green from its first charge. I'll update this review with how long a full charge lasts when I've gone through a full cycle. Lastly, you can detach the battery pack (and the front torch itself if you want) and wear them as a belt attachment. I personally prefer the light being cast wherever I'm looking, and didn't find the battery pack intrusive where it was, so haven't used this option. It's so bad that at first I thought I might have been sent a fake item, since I couldn't imagine any self-respecting manufacturer allowing such a poorly-translated document to accompany their product. But, the supplier I used (ffx.co.uk's) bona fides checked out. And, checking with LED Lenser's own website, it seems that they've just done a very bad job of translating the user manual of an otherwise very good product. You can read the full manual (downloaded from LED Lenser's US site) for yourself here. All-in-all, I’m glad I bought this piece of kit. It’s good enough for what I need it for. The head harness could be a little more comfortable, but it’s very usable for its intended purpose nonetheless. I feel a Petzl and other cheaper options would probably not have been bright enough for what I need. And other more expensive options would have been brighter still, but wouldn’t have been designed to wear out of water.